In a recent article, in celebration of Black History Month, I revisited a black American whose shattering of PC icons has gotten him all but flushed down the memory hole of history. That man is George S. Schuyler (1895-1977). In addition to being a superb and prolific writer, Schuyler was a daring and genuinely free thinker. Unlike most of his contemporaries and ours, Schuyler refused to acquiesce in the fashions of the times. Schuyler was unabashedly, passionately opposed to communism, and for the methods and national leaders of the Civil Rights movement he was contemptuous. Take as but two notable examples Schuyler’s thoughts on Martin Luther King, Jr. and Malcolm X. For all of his criticisms of King, Schuyler nevertheless commended him for what he thought was King’s sincerity of belief, genuine commitment to a worthy cause, and his talent of being “adroit.” However, for Malcolm X, another figure to emerge (eventually) from the 1960s as a Civil Rights giant, Schuyler had nothing but contempt. Schuyler once debated Malcolm (along with James Baldwin and some others). 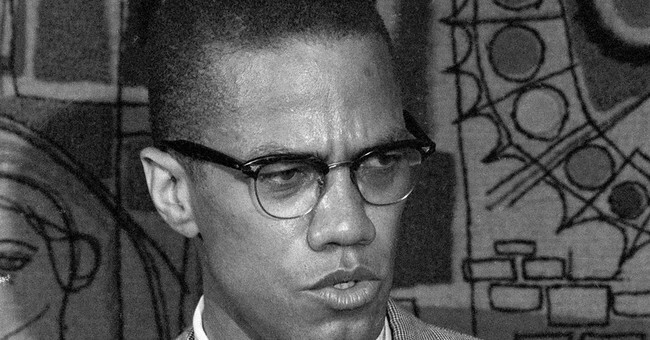 Looking back on the event in 1973, eight years after Malcolm’s murder, Schuyler confesses to having been “initially astonished” by Malcolm’s “wide ignorance.” During that debate, Schuyler informed Malcolm—who was a spokesperson for the Nation of Islam, at the time—that there existed throughout the world many white Muslims and that Muslims were enslaving Africans for centuries before Europeans stepped foot on the continent. Schuyler continues: “Like most of the loud-mouthed black leaders, he had but a tiny following…and all equally ignorant, if not more so,” than Malcolm himself. The common revisionist narrative today is that Malcolm X left the Nation of Islam after he had a change of heart and realized the wrongness of its anti-white ideology. Yet Schuyler saw then what in fact happened. Muhammad ordered his ministers to refrain from uttering a syllable to the media in the wake of John F. Kennedy’s assassination. Malcolm, though, couldn’t resist characterizing this as a case of “the chickens coming home to roost.” In response, Muhammad terminated his premiere minister. Malcolm retaliated by spreading the word that Muhammad had been fathering children out of wedlock and, from that moment on, became a hunted man. Desperately in need to remain relevant, Malcolm embarked on an eleven day trip that included a pilgrimage to Mecca. Upon returning, he claimed to have achieved a kind of racial enlightenment while abroad: He now recognized what Schuyler had schooled him about years earlier—that not only were whites people too, they could even be Muslims! And Malcolm’s Organization of Afro-American Unity (OAAU) continued to espouse “the same old racist bilge” in its newsletters. Schuyler was having none of it: “It is not hard to imagine the ultimate fate of a society in which a pixilated criminal like Malcolm X is almost universally praised [. ]” It is a society that has sown the seeds of its own destruction. Let us revisit the work of George S. Schuyler this Black History Month—and every month.